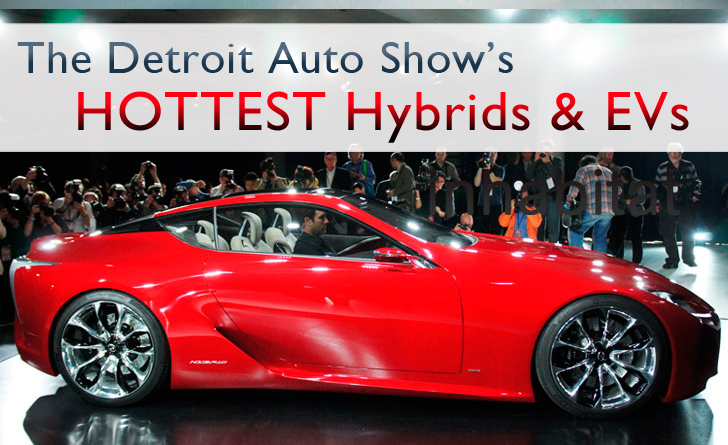 No need to be crestfallen if you couldn't make it out to the Detroit Auto Show this week - Inhabitat was on the showfloor checking out all of the smoking hot new hybrids and electrifying EVs and we've rounded up our favorites for you. From the jaw-dropping Lexus LF-LC to the until now top secret Volkswagon Electric E-Bugster to the Ford Fusion Energi Plugin Hybrid, which is being called the world's most efficient sedan, check out our top picks for the newly unveiled hybrid and electric vehicles that dazzled us the most at the 2012 North American International Auto Show. 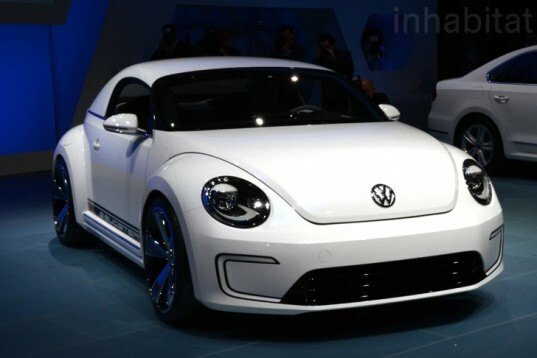 Can you imagine being a fly on the wall when Volkswagen finally took the covers off of its closely guarded E-Bugster electric concept vehicle? The curvaceous auto definitely lived up to the rumors that it takes after another kind of bug, the Beetle, although we thought it had a bit of Jetta or Golf mixed into it’s gene pool as well. Living up to the title of world’s most efficient sedan is a tough job but Ford Fusion Energi Plugin Hybrid takes it all in stride. With its plug-in hybrid drivetrain capable of achieving the equivalent of 100, yes, 100, mpg, this blue beaut also touts nifty advancements like a system that parallel parks it automatically. We swear we felt the earth move a little when Lexus unleashed its eye-popping red LF-LC hybrid sports coupe on us unsuspecting NAIAS-goers. Part beauty, part beast, this hot little number made waves with its elegant design and super boosting hybrid powertrain engine. 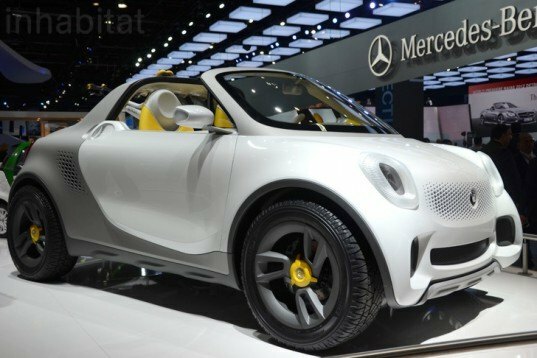 Smart is known for its less than large electric vehicles so it was a bit of a surprise to see that they decided to try their hand at a pick-up truck concept. However, the all electric “For-Us”, which was introduced by Jon Lovitz impressed us with its sporty design and ability to remain compact despite being able to carry a lot of cargo. 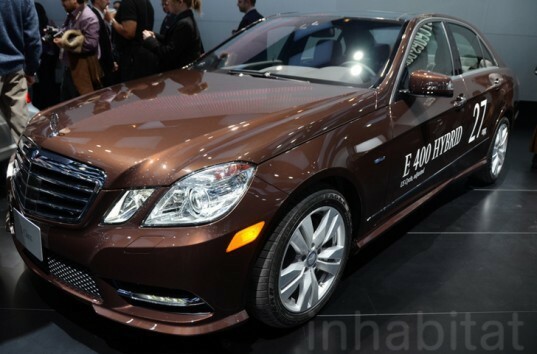 Mercedes-Benz proved to NAIAS-goers that green cars can go hand in hand with luxury by unveiling their hybrid car cousins, the E300 diesel hybrid and the E400 gasoline hybrid. Touting the E300 as the most efficient luxury car in the world, Mercedes showed off the techy amenities in both of the classy cars. Drivers who can’t get enough of BMW’s very popular 3 and 5-series sedans can now find hybrid versions – the ActiveHybrid 3 and the ActiveHybrid 5. Both cars retain all of BMW’s envy-inducing appeal, but come equipped with fuel-saving hybrid powertrain engines under their hoods. Volkswagen makes our list again, this time with the brand new Jetta Hybrid sedan that it unveiled on Monday at the Detroit Auto Show. Unlike the E-Bugster, which is still in concept phase, the Jetta is already poised to become one of the best-selling hybrids on the market with its fuel-efficient engine and sporty but elegant body. 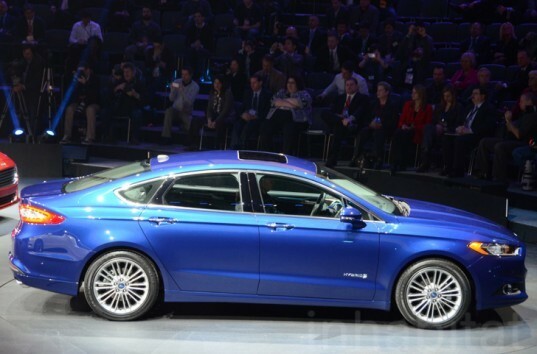 Ford Fusion Energi Plugin Hybrid Living up to the title of world's most efficient sedan is a tough job but Ford Fusion Energi Plugin Hybrid takes it all in stride. With its plug-in hybrid drivetrain capable of achieving the equivalent of 100, yes, 100, mpg, this blue beaut also touts nifty advancements like a system that parallel parks it automatically. Volkswagon Electric E-Bugster Can you imagine being a fly on the wall when Volkswagen finally took the covers off of its closely guarded E-Bugster electric concept vehicle? The curvaceous auto definitely lived up to the rumors that it takes after another kind of bug, the Beetle, although we thought it had a bit of Jetta or Golf mixed into it's gene pool as well. Smart For Us Electric Pickup Smart is known for its less than large electric vehicles so it was a bit of a surprise to see that they decided to try their hand at a pick-up truck concept. However, the all electric "For-Us", which was introduced by Jon Lovitz impressed us with its sporty design and ability to remain compact despite being able to carry a lot of cargo. Mercedes Hybrid E300 and E400 Mercedes-Benz proved to NAIAS-goers that green cars can go hand in hand with luxury by unveiling their hybrid car cousins, the E300 diesel hybrid and the E400 gasoline hybrid. Touting the E300 as the most efficient luxury car in the world, Mercedes showed off the techy amenities in both of the classy cars. 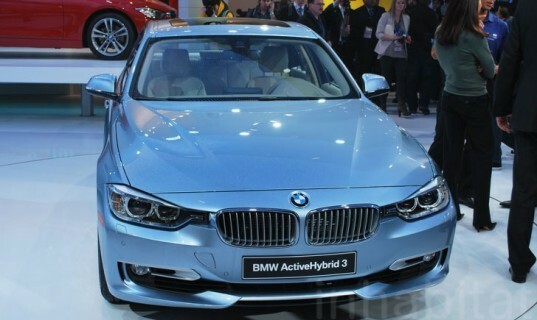 BMW ActiveHybrid 3 and ActiveHybrid 5 Drivers who can't get enough of BMW's very popular 3 and 5-series sedans can now find hybrid versions - the ActiveHybrid 3 and the ActiveHybrid 5. Both cars retain all of BMW's envy-inducing appeal, but come equipped with fuel-saving hybrid powertrain engines under their hoods. 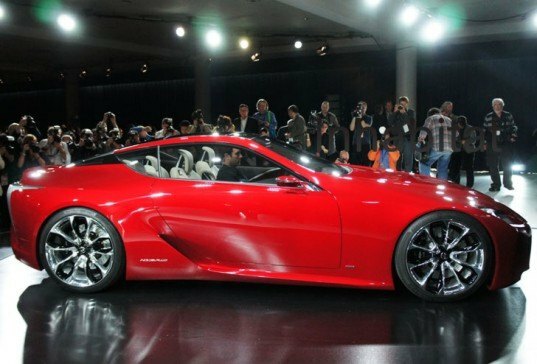 Lexus LF-LC Hybrid Sports Car We swear we felt the earth move a little when Lexus unleashed its eye-popping red LF-LC hybrid sports coupe on us unsuspecting NAIAS-goers. Part beauty, part beast, this hot little number made waves with its elegant design and super boosting hybrid powertrain engine. 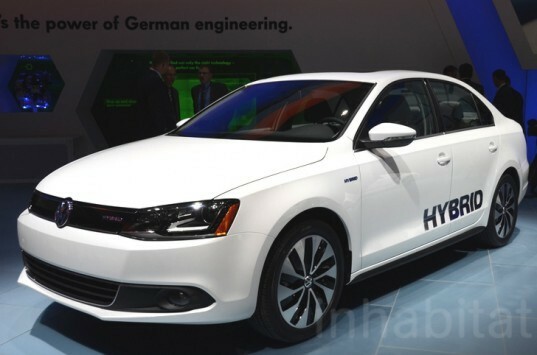 Volkwagon Jetta Hybrid Volkswagen makes our list again, this time with the brand new Jetta Hybrid sedan that it unveiled on Monday at the Detroit Auto Show. Unlike the E-Bugster, which is still in concept phase, the Jetta is already poised to become one of the best-selling hybrids on the market with its fuel-efficient engine and sporty but elegant body.